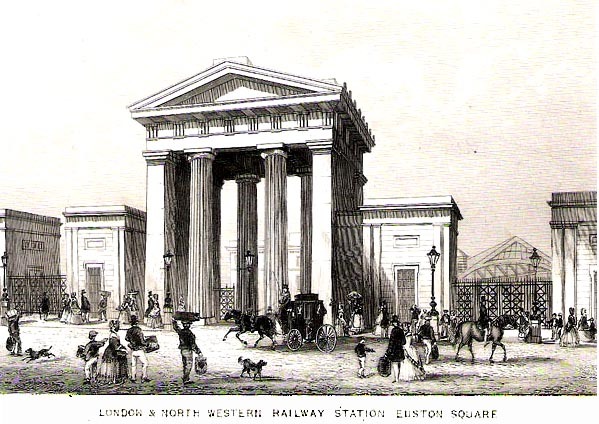 Doric Arch at Euston Station, the terminus for the London and Birmingham Railway, designed by Philip Hardwick (1792-1870). 1839. 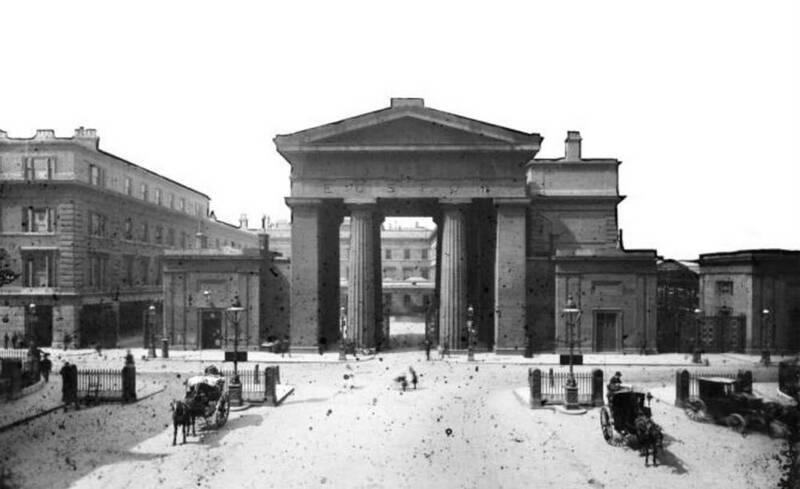 Demolished 1963. Hardwick here drew a forceful analogy between contemporary England and ancient Rome with his arch, which represents both an ancient and an entirely new way of entering an imperial city. Architectural historians point to the arch as a pioneering attempt to create a new visual vocabulary for railways and railway stations. 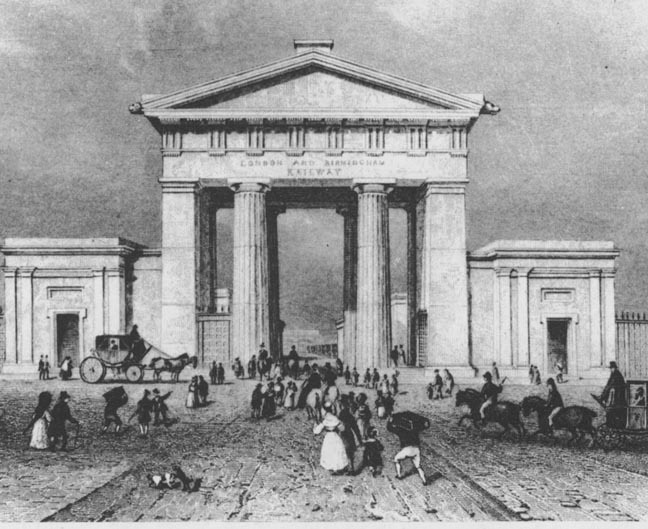 Although most major British and American Victorian railway stations used some version of the gothic revival style, Hardwick's approach appears in major American stations in the classical style of the next century, such as New York's magnificent Grand Central Station and Pennsylvania Stations (the former now restored to all its marble glory and the latter demolished, alas) [GPL]. 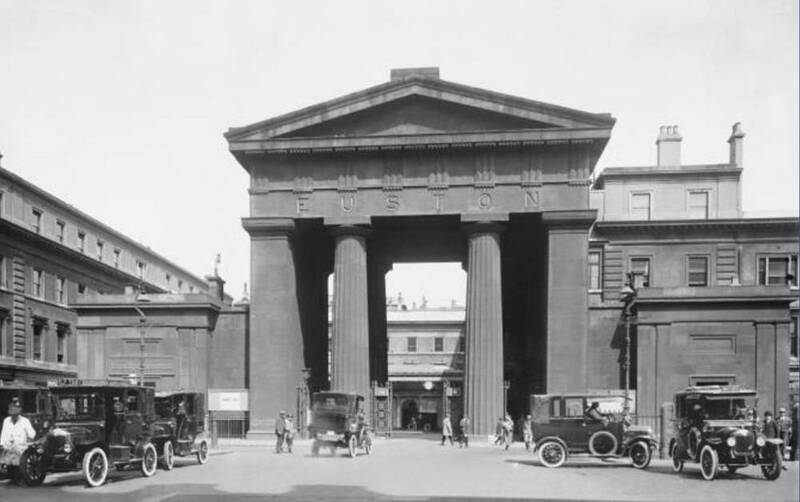 The gate to the right of the main one at Euston led to the carriage dock at the end of the lines. This was a luxurious feature designed to placate hostility to the new mode of transportation. Lordly clients would drive up to this o dock in their own carriages, which would then be detached from the horses and put on a flatcar with the horses in a box car. The owner could ride in his own carriage or a regular one. At the destination the loading process was reversed, and the equipage was at hand for the next step of the journey. This feature had to be abandoned because of the inconsiderate behavior of clients who would drive up to the station at the last minute and by the time the loading was effected delay the train half an hour. — Carol Meeks, p. 33. [You may use this image without prior permission for any scholarly or educational purpose as long as you (1) credit the © National Railway Museum and SSP and (2) link to its webpage. It would be nice to cite the Victorian Web, too.